Andrew’s thoughts: 2016 Felix Hernandez is definitely not worth 14% of a team’s budget space heading into 2017. But 2015 Felix Hernandez might be, and 2009-2014 Felix Hernandez most definitely is. Truthfully, I think all of King Felix’s innings have caught up to him and going forward, he’ll be more 2016 than 2015 and definitely more 2016 than 2009-2014. But here’s the thing: I got $1 of 2017 auction budget last May for Wilmer Flores, so I’m really just sending that dollar for the option to decide what to do with Felix in January or February. I suspect that the Mariners will continue to manage him like he’s their ace regardless of the numbers he’s putting up, which means squeezing seven innings from him when they’d probably pull Tai Walker or James Paxton after six. More innings means more outs, and more outs means more points. He averaged more than six innings per start last year. On a normal team, the choice is easy: cut him and send him back to auction. What does he go for at auction next year? $25? $30? But I’ve run my projected keeps and cuts, even with $15 greed built in, and I project to have an ample surplus of auction cash. That’s before factoring in Felix’s hefty $70, but even after accounting for it, I should still be among the leaders in budget space (and if I’m not, that means several teams took machetes to their payroll, which means there should be plenty of talent to go around at auction). 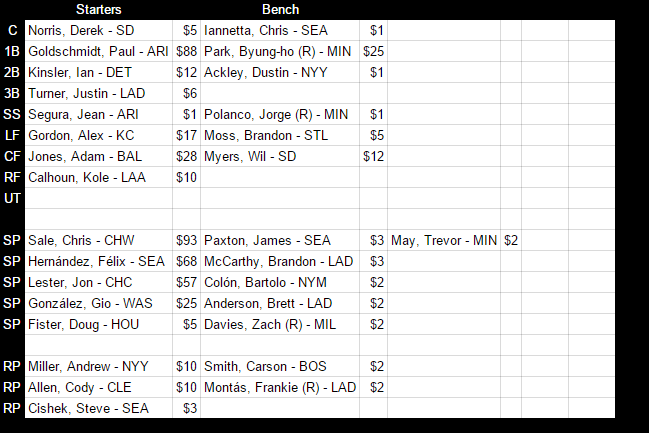 My pitching staff for next year looks to cost less than $10/starter without Felix. With Felix, that jumps over $15/starter. If you look at it as just an overall cost of a pitching rotation, Felix’s $70 becomes easier to absorb. For HLR, it’s clear Felix was never going to be kept anyway. He was acquired solely for a playoff run. Compared to his price on August 2 (a reasonably priced MLB outfielder and two quality prospects), $1 of auction budget is nothing. I realize we’re not comparing apples to apples, but whatever. Anyway, HLR turns a player he was going to cut into an easy $1, which maybe makes the difference in a bidding war. He’s up to, I think, $507 in total budget now, so he’s incrementally improved his freedom to spend. Long story short: HLR gets something instead of nothing, I get a decision to make come roster cut time.